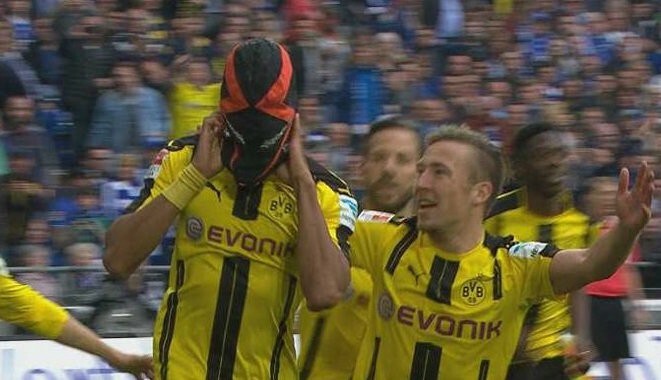 Pierre-Emerick Aubameyang has a penchant for celebrating goals by wearing masks. He’s done it with Batman and Spider-Man masks in the past, so when he did it again with a nondescript mask when he scored in last weekend’s Revierderby it seemed like it was just more of the same. Except it wasn’t. It was part of his new “Masked Finisher” campaign with Nike. A few weeks earlier, Aubameyang played with a Nike swoosh in his hair. The problem with all this? Dortmund are sponsored by Puma, so to have all this Nike business going on during their matches is a source of discomfort. Bild added that Aubameyang — booked for his celebration by referee Felix Zwayer — is set to be fined €50,000 by Dortmund, for whom Nike supplied kit over two spells in the 1990s and 2000s. Puma shouldn’t be surprised by this, though. 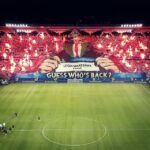 Nike did something similar a few years back to Adidas-affiliated Bayern Munich by having Mario Götze wear a shirt with their name emblazoned across it at his unveiling. It’s a clever ploy from Nike—undermining their German competitors in their own backyard. Hopefully they’re nice enough to pay their athletes’ fines, though.